A survey of European organisations revealed that consumer-facing organisations are more likely to have achieved a higher level of domain maturity than non-consumer-facing or B2B organisations. Consumer-facing organisations are more likely to have outsourced online customer service. Consumer-facing businesses are most likely to have dealt with security and performance issues thus freeing themselves to focus on bottom line issues such as attracting new customers. A survey indicated that consumer-facing organisations regard their online presence as more important than do non-consumer-facing businesses. 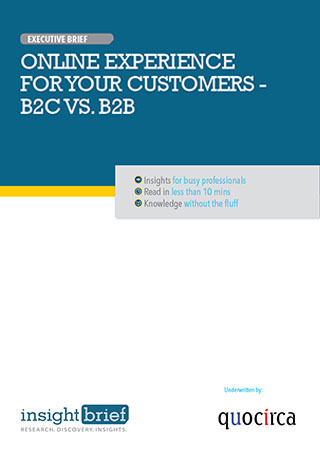 B2B organisations tend to be laggards in management of online relationships partly due to the fact that B2B customers tend to be more forgiving than other consumers. Consumer-facing organisations report greater investment in basic performance monitoring and customer-related issues than non-consumer-facing organisations which spend their budget on monitoring bandwidth and collecting system information.